KIEV, December 15. /TASS/. Ukrainian President Pyotr Poroshenko has declared establishment of a new church in the country - the Autocephalous Orthodox Church. "I congratulate everyone on setting up the Ukrainian Autocephalous Orthodox Church which has been just created at St. Sophia’s," he said addressing the crowd in Sofiyskaya Square after the end of the ‘unification’ council. Metropolitan Epiphany of Pereyaslav and Belotserkovsk, who had earlier served as a bishop of the uncanonical Kiev Patriarchate, was elected head of the new church. Poroshenko recalled the words of Ukrainian poet Taras Shevchenko, saying: "As Taras Shevchenko once said Ukraine would not be drinking Moscow’s poison from the Moscow cup." 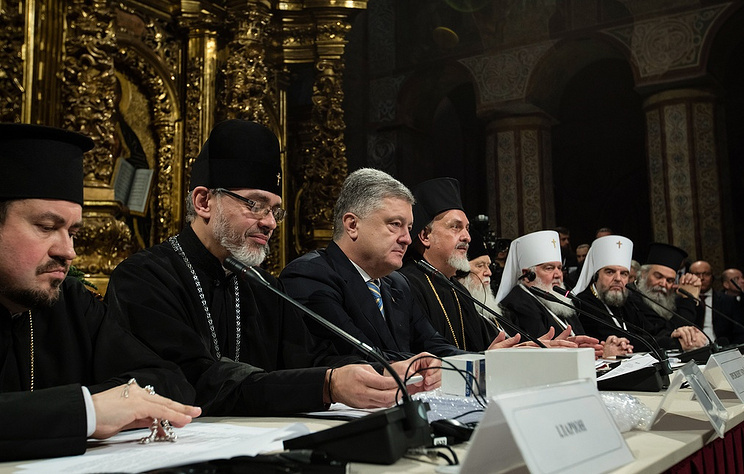 On Saturday, the St. Sophia’s Cathedral in Kiev hosted a so-called ‘unification’ council held under the auspices of the Ecumenical Patriarchate of Constantinople and brokered by the Ukrainian authorities. The council pursued a goal of creating a new local Orthodox Church estranged from the Moscow Patriarchate. The church will be formally granted an autocephalous status, but in fact, it will be under the Ecumenical Patriarchate of Constantinople. The council was expected to consider two main issues, namely the new church’s charter and the election of its head. The organizers planned that representatives of the canonical Ukrainian Orthodox Church and two schismatic groups, the Ukrainian Orthodox Church of Kiev Patriarchate and the Ukrainian Autocephalous Church, will attend the council. Nonetheless, the Ukrainian Orthodox Church turned the invitation down lashing out at the council as illegitimate. 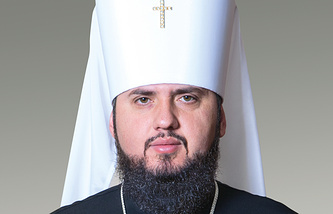 On December 7, the Ukrainian Orthodox Church’s Holy Synod said that the Ecumenical Patriarchate of Constantinople had no canonical right to convene any church meetings in Ukraine and that "neither the clergy nor the laity have been authorized to represent the Ukrainian Orthodox Church at that meeting." On Saturday, only two from 90 archbishops of the canonical Ukrainian Orthodox Church attended the assembly. They are Metropolitan Alexander (Drabinko) of Pereyaslav-Khmelnitsky and Vyshnevsky and Metropolitan Simeon of Vinnitsa and Barsky. Kiev has attempted to create a Local Orthodox Church in Ukraine independent of the Moscow Patriarchate since 1991. In April 2018, Poroshenko wrote a personal letter to Ecumenical Patriarch Bartholomew of Constantinople asking for autocephaly for the Ukrainian church. On November 13, the Council of Bishops of the canonical Ukrainian Orthodox Church held its meeting in Kiev Pechersk Lavra (the Kiev Monastery of the Caves). The Ukrainian Orthodox Church announced after the meeting it did not recognize Constantinople’s decisions on Ukraine and said it was severing full communion with the Ecumenical Patriarchate. The Ukrainian Orthodox Church also spoke out against joining the process of granting autocephaly to Ukraine’s church and said it opposed its name change. On December 5, Poroshenko announced that the so-called unification council to create the Ukrainian autocephalous church would take place on December 15. He said that Patriarch Bartholomew had sent letters to bishops of the Ukrainian Orthodox Church of the Kiev Patriarchate, the Ukrainian Autocephalous Orthodox Church and the canonical Ukrainian Orthodox Church "inviting them to take part in that historic event. ".